"Chip 'n' Dale Rescue Rangers"
Dale accidentally falls into a city garbage truck while cleaning up. The Rescue Rangers help a little girl find her kidnapped kitten. At the end of their vacation to Earth, one of three aliens decides to stay. One of the most popular television shows is "Flash the Wonder Dog." However, animal villain Fat Cat has grown tired of Flash's heroic antics, and has the dog-actor kidnapped. Donning disguises to make them resemble Flash, Fat Cat and his minions attempt to tarnish the dog's good name. 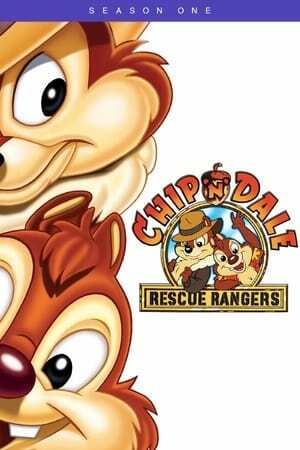 The Rescue Rangers decide to find the real Flash at Dale's behest, but what will happen when the eager chipmunk realizes his hero isn't a real hero after all? The Rescue Rangers visit the Space Center to watch a launch. Deep in the jungle, a tribe of kiwi birds have stolen the Ranger Plane. While in pursuit of the famed Maltese Mouse, the Rescue Rangers accidentally wreck the home of a family of squirrels. While the Mother squirrel straightens up her abode, the Rangers offer to take care of the squirrel children, Tammy and Bink. While Monterey Jack and Dale tend to little Bink, Chip has his hands full trying to deal with Tammy, who has developed a crush on him. The Ranger Plane crashes into the Baskerville Mansion. When a prissy Queen Bee finds her hive of workers have been stolen, she goes to the Rescue Rangers for help. Zipper is also eager to help, and develops a crush on the beautiful Queen Bee as well. While on a shopping spree, the Rescue Rangers meet a rare booby bird. A flying doghouse puts the Rescue Rangers on the trail of Ali Bimbo. While on vacation, a young camper, befriends a bear. The Rangers go to the docks to meet Monterey's dad, Cheddarhead Charlie. Disney produziert Live-Action zu "Chip und Chap"